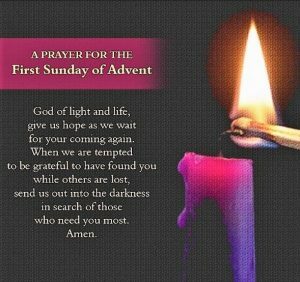 Discussion Guide for First Sunday of Advent Year C.
Advent begins today. The colour purple has an interesting background for us to ponder. Purple dye historically originated from a tiny shell-fish. It took 12,000 shell fish to make 1.5 grams of pure dye. The expense meant it was used only by the wealthy and became a symbol of royalty. Advent purple indicates we are waiting for the coming of the King of Kings. We are ‘preparing’ for the birth of Jesus but also spiritually for the second ‘coming’. Ponder for a few minutes what you would do if in 4 weeks time you were truly going to stand before Jesus Christ the King. • Jeremiah was a prophet in a very difficult time. Jewish King after Jewish King had failed to bring peace. God’s people were now in exile in Babylon. In the midst of foreign people and their gods Jewish people began to lose hope. Jeremiah reminds them of a promise made by God to believe in: I will raise up a ‘just shoot’ from the line of David. So beautiful will this event be, the great city of Jerusalem will be renamed – Justice! In the midst of life’s difficulties what brings you hope? Frequently we think of God’s love, but do we recognise what God really wants is ‘justice’. Do you hope for this as a future event or do you give your life to its fulfillment ‘today’? • Thessalonica was one of the earliest Christian communities. A port city bringing trade and culture, hot springs bringing tourists. It was prime real estate in a Roman provincial town. With many cultures came many gods, Greek, Egyptian, Roman Emperor worship. Paul had been chased out of this town quickly but had established a small group of Christian followers. He writes to encourage them to be blameless in holiness, living lives pleasing to God. Ready ʻfor the coming of our Lord Jesus with all his holy ones’. Picture your own town instead of Thessalonica. What is the purpose of ʻconducting yourselves to please Godʼ? Is it only for heaven or a sign for people ʻtodayʼ of heaven? • Year C begins with our move from the Gospel of Mark to the Gospel of Luke. Luke’s community is tired of waiting on a promise of Christ’s return. Luke gives instruction on how Christians are to live while ʻwaitingʼ. What does the image: ʻstand erect and raise your headʼ mean to you. What would make you do this? What does living in readiness ʻnowʼ actually look like for you? • Luke contrasts people of the ʻworldʼ with hearts drowsy or hardened with excessive sensual pleasure, drunkenness, worries, with Christian disciples watchful and vigilant, praying and ready to stand before the Son of Man. Where are you in this picture? What advent practices could you begin to be ʻvigilantʼ ʻprayerfulʼ ʻreadyʼ? What would you like to bring to God in the Advent practice of receiving the sacrament of reconciliation? • We all know what December will involve: shopping, christmas cards, cooking, end of year celebrations. Will you be satisfied? How could you ʻslow downʼ and set aside time to soak up the christian focus of Christmas – is there a church near or on the journey from work you could visit for 5 minutes daily? • Christians view the end of the world differently: ʻWhat the caterpillar calls end of the world, the Master calls a butterfly. 33rd Sunday – Get ready! In the context of the Church’s liturgy, the 33rd Sunday is only one week away from the end of the year. Next week is Christ The King. Liturgically we enter an atmosphere of reaching the ‘end of time’. Because of this pattern todays readings have an apocalyptic atmosphere of end time struggle and judgment. Daniel means ‘My judge is God’. The Book of Daniel is written during a time of great persecution when Antiochus Epiphanes is forcing Jews to convert to pagan gods. Here is the first time in Hebrew scriptures that a resurrection of the faithful is mentioned. God is the master of history. All those ‘in the book’ who ‘shine brightly’ and lead people on the way to ‘justice’ will be like stars living forever. Examine your own life. How would the statement ‘my judge is God’ shape your life? Antiochus may not be forcing you to eat pigs flesh (abhorrent and unclean to Jews) but what idols or practices are you subtly invited to ‘eat’? The Letter to the Hebrews concludes. We are taught about the sacrifice of Jesus fulfilling and finishing the Old Testament sacrifices. Notice the image of the Old Testament Priest ‘standing’ and working each day. Jesus, after the sacrifice of the cross, now being ‘seated’ and waiting for the time of gathering. Consider the victory and offer of forgiveness that has taken place on the cross. Imagine a winning sports team lifting the captain high onto their shoulders with winning trophy held high! This sacrifice of the cross – like a trophy – is held by the priest in the consecration of the bread and wine into the sacrifice and body and blood of Jesus. We stand together rejoicing. And we receive this sacrifice as a sacred forgiveness and communion meal bringing us into a total physical and spiritual union with God and each other. Do you see the depth and great celebration taking place at Mass? What would you like to learn more about? Who could you ask? The Book of Daniel and The Book of Revelation are apocalyptic writings ʻunveilingʼ a vision of what will take place at the end of time. Each Gospel inserts some apocalyptic passages pointing toward that final day. The images of the sun darkened, stars falling, heavenly struggle, share a cosmic event affecting all of creation. Have you noticed that at the crucifixion of Jesus these images appear. Could this mean that the final ʻeventʼ and ʻstruggleʼ and ʻvictoryʼ has taken place on the cross? Could this be why the early disciples were so expectant of Jesusʼ return before ʻthis generation passed awayʼ?